The bright and cheery season is finally here! 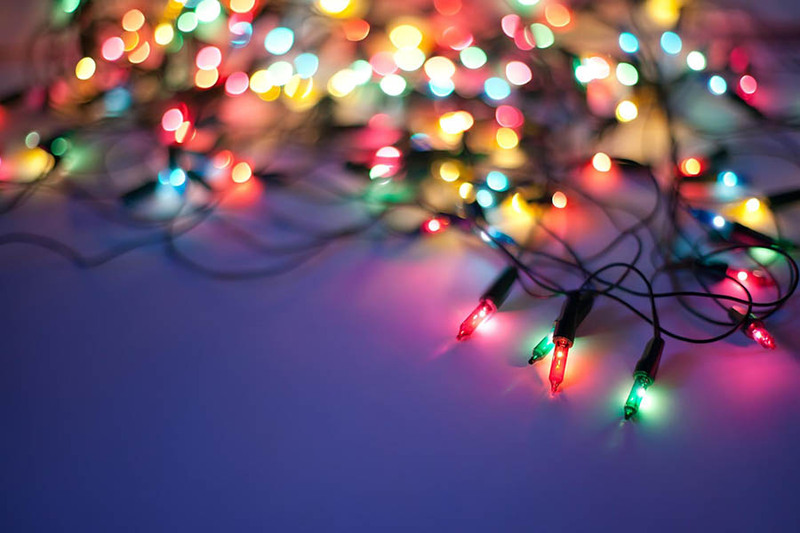 String up the twinkling lights, bust out your ugliest sweater, and get to work decking out your website. Yeah, I do sound like the Grinch right now. But getting festive for Festivus (and all the other major end-of-year holidays) can actually give your website more chances to unwrap extra visitors. If your cup of ideas isn’t running over, we’ve got you covered. Our gift to you? Ten great ways to freshen up your website for the holidays. Batteries not included. Before you delve too deep in creating new holiday campaigns, take the time to look at the results of your holiday promotions from last year. Hopefully, you already did this when you were prepping your website for Black Friday and Cyber Monday. But if not, let’s refresh! First, take a moment to reflect. What are your company goals? And what do you need to get out of the holiday shopping season: more sales, leads, or subscribers? Every action you take, including fun holiday marketing campaigns, should drive toward those goals. If the campaign you’ve got in mind won’t help you achieve your goals, put that idea on the naughty list. Which promotions registered with customers last December? Which ones fell flat? Before you put fingers to keyboard, take a look at last year’s results and build from there. Run the numbers to find out what deals you can afford to offer during the holidays. Then use this information to help you choose which holidays ideas to implement on your website. You need to know how you’re going to spread the word about your holiday campaigns and promotions. So ask yourself: Do you have an email subscriber list? How strong is your social media presence? Is one platform stronger than the others? Have you ever used PPC? What have your competitors done for the holidays that you could tweak for your specific audience? Make a list. You can even look to big brands for ideas (lots of inspiration coming your way). Got all that? Okay, on to the ideas! First things first, let’s get technical to make sure your website is geared up and ready for the season. You can do this by checking with your hosting provider to plan for any surges in traffic. If you need to upgrade for more resources, do it before the holidays hit. That way, you won’t run into issues when all those visitors come knocking on your website’s door to get your holiday deals. Next, make sure your payment gateway can handle more transactions. You may also want to consider upgrading your services to accept more forms of payments and double check your security features. The gifts of convenience and security are the type of holiday cheer your customers will appreciate. Need a baller payment gateway for your website? Here are 10 can’t-miss options. Finally, optimize to reduce your site’s load times. I could give you a mile-long checklist for this, but you’re busy — I get it. Instead, try these ten speedy-site tips, and then test your site’s performance with Google’s PageSpeed Insights. Your customers are used to your website’s regular look, and that’s great — for most of the year. When the holidays roll around, though, consider giving your site a little extra sparkle. 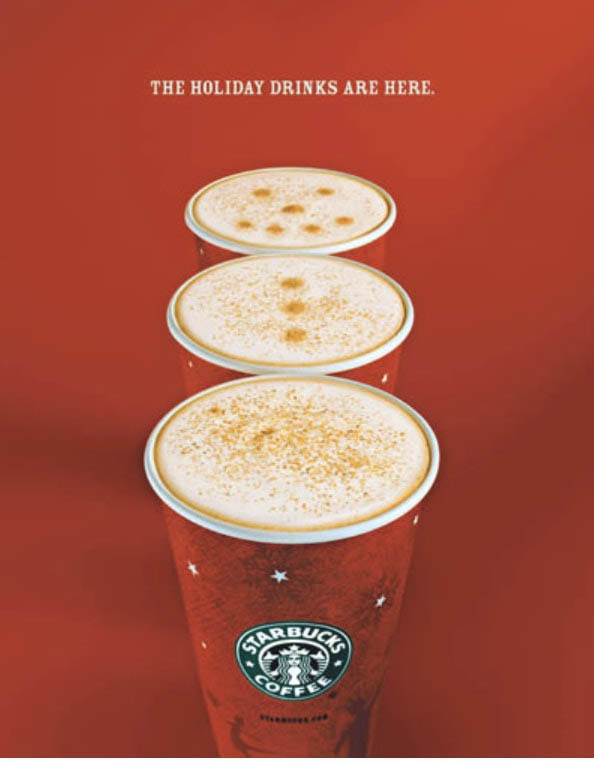 Everyone is used to the company’s white-and-green siren, but come November 1, Starbucks’ cups get a little more festive. Obviously, your website isn’t a paper cup. So when it comes to zhuzhing up your homepage, a lot of jingle can go all the way. 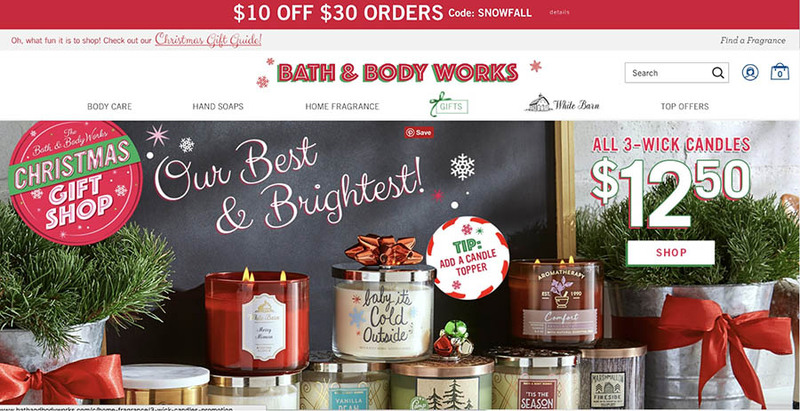 Let’s look at a brand that does holiday cheer well: Bath and Body Works. As soon as visitors hit the website, they are greeted with twinkling snowflakes and a giant, festive banner image. Even their promotion code is cheery: SNOWFALL. One word of warning (and good, old-fashioned marketing advice): know your audience. When you opt to make your branding more holiday-themed, pay attention to how your customers receive it. If you’re worried, solicit customer feedback, run some A/B tests, or hold a focus group. You don’t want to catch any flack — like Starbucks often does — for being too much this way, not enough that way. Of course, it’s easy to get caught up in making sure your website is perfectly festive. However, it’s vital to remember that many customers won’t see it — unless you email them with a link and a good reason to return to your homepage. Long-time readers and first-time commenters alike will probably remember that we’ve gone in-depth before on why website owners need to get serious about email marketing. It’s the single-most-effective marketing tactic for awareness, acquisition, conversion, and retention. You want a slice of that pie! WordPress users! Learn how to build your own email subscriber list directly on the platform. Most of all remember that your subscribers opted into your email list for a reason: they want to hear from you! Don’t forget to wish them well this holiday season and share your good news. 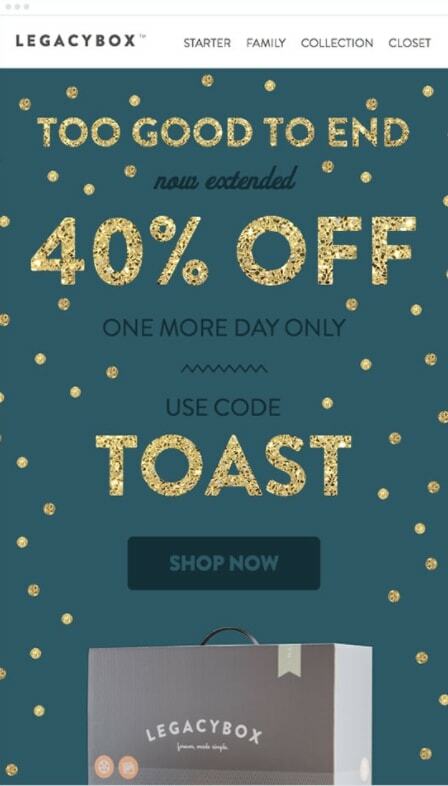 After all, who doesn’t love a killer sale like this offer from Legacybox? Sometimes the best way to get your website visitors in the holiday spirit is to make them laugh. Of course, how you do this is largely up to you and what works for your brand. JibJab allows visitors to personalize hilarious videos and send them to friends and family. Each year, the site offers a series of customizable holiday cards that are bound to make their customers laugh, share, and repeat. Kmart is another brand that has used humor to increase sales during the holidays. While the Jingle Joes might not “resonate” with everyone, the use of humor is a good way to stand out during a very competitive shopping season. Lastly, don’t be afraid to go dark. Like real dark. For a lot of people, getting together with family for the holidays isn’t a friggin’ Hallmark movie. 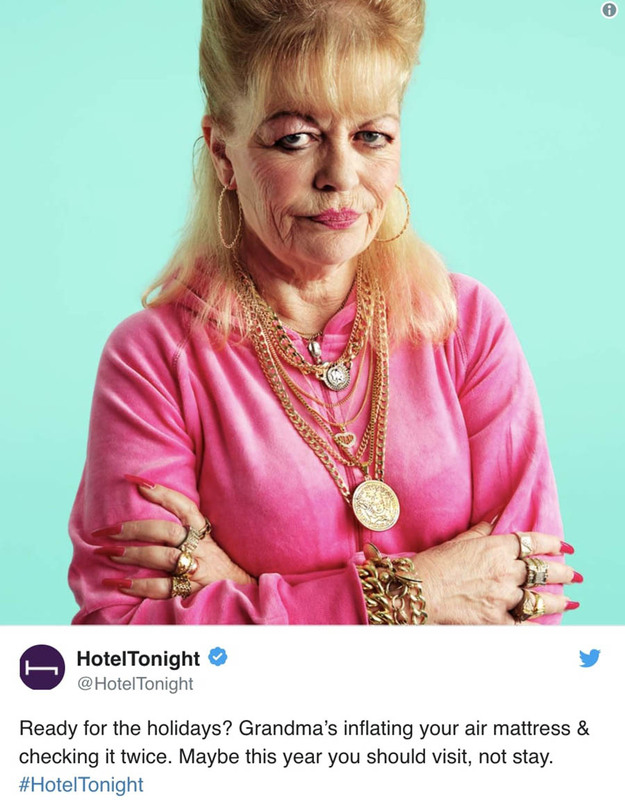 HotelTonight took all those bad feels and translated them into this dark-comedy dream. You don’t have to be a hotel booking website to pull this off either. Get creative and think about your specific target audience. The world is your air mattress — erm — oyster. No matter what products or services you offer, you can group them together during the holiday season and offer a holiday combo on your website. Dollar Shave Club nails it each year. The holidays can’t handle a gift like the DSC Holiday Shave Set. Get one today. Link in bio. As you can see, the shave kit is exactly like the ones they offer every other month of the year. Only the context! The Elf on the Shelf signals holiday hijinks are afoot without the brand having to do any repackaging of their product. This time of year, people like to see holiday promotions. Even if you are selling the same old thing, dress up the way you promote to match the season. Almost everyone has a hard time waiting for the holidays (even if you can’t wait for them to be over, amirite, Scrooge?). But as a website owner, you can use all that anticipation to drive hype for your business. Take H&M. The brand created a short trailer to tease its 2017 holiday collaboration with Nicki Minaj. Of course, if you don’t have the budget to hire a mega-watt celebrity to headline your holiday campaigns (pssst, have you heard of micro-influencers? ), then you can always build hype the old-fashioned way: with a countdown! 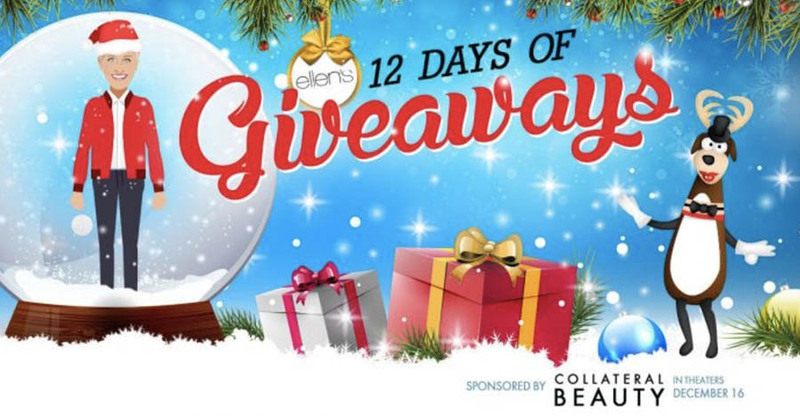 Ellen famously does the “12 Days of Giveaways,” and it’s hugely successful. Hitch your sleigh to that idea by doing 12 days of promotions, deals, even blog content — anything that will resonate with your customers. There is nothing naughty about leaning into the sense of urgency and excitement that comes with the holidays. If there’s one thing for certain about the holiday season, it’s this: people gain weight. Yeah, your pants aren’t lying; holiday weight gain is real. And so is the motivation to lose the weight come January 1. Don’t worry I’m going somewhere with this. If you are a brand that holds a special level of expertise on a holiday-related topic, then the time is now to jump in and start sharing. For example, if you are a doctor, wellness coach, purveyor of health supplements, or self-styled weight-loss guru, then focus your content on how people can stay healthy during the holidays. Need an example? It’s like that one time we talked about tech-themed horror movies for Halloween. Look for a niche that you have expertise in and find a way to tie it to the season. Not like Drunk Uncle real. I mean genuine. The holidays are a great time to share what your brand is really about. Their “Unwrap the Feels” video captures the spirit of the holidays by showing a collection of darling families gathering together. It’s so darn charming, that by the end, you might get a bit misty-eyed — and want to purchase some of Samsung’s magical family-bringing-together products. You don’t have to pull heartstrings to win hearts, though. If you are getting jolly around the office, let your customers in on the fun. Chances are they’ll be interested in the team that keeps their favorite products on the market. When you hold an office party or volunteer for a charity project, make sure you share the real, unfiltered you with your customers. When it comes right down to it, the holidays are about giving back. There is no better time to focus a little less on the bottom line and a little more on making the world a better place. For instance, you could make a donation to a charitable organization or sponsor a company-wide day of service. DYK? DreamHost is currently matching up to $10,000 for donations to Charity:Water. Looking for a viral way to spread joy to your customers? Host a giveaway or contest on social media. 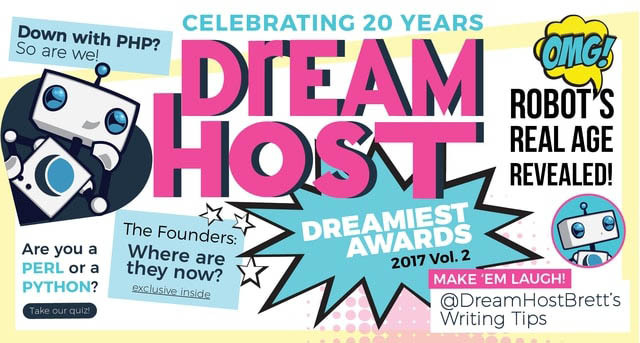 Last year DreamHost gave back to our customers with “The Dreamiest Website of the Year Awards.” Customers were able to submit their websites for a bevy of awards. The winners got swag, cash, and bragging rights. It was a fun way to thank the people who keep us in business. After the hype has died down, take some time to ramp up your content production. Why? Because once the merriment is over, your customers will be thinking about the next big thing: the new year! Come January, DreamHost customers are looking for help building a brand new website to kickstart their resolutions, whether they’re starting a blog or a business. Think about what your customers will want to do next year and start creating content to help them do just that. The new year is a fresh start for everyone. Stay on top of your content strategy by preparing in December for a big rollout of fresh ideas in January. There you go! We hope you’ll enjoy (and use!) these 10 gift-wrapped holiday ideas to connect with your customers during the holiday season. And we want you to get in on this too! Tell us: how have you decked out your website in years gone by? And what are you trying for the first time this December? Spread the good cheer with us on Facebook or Twitter. 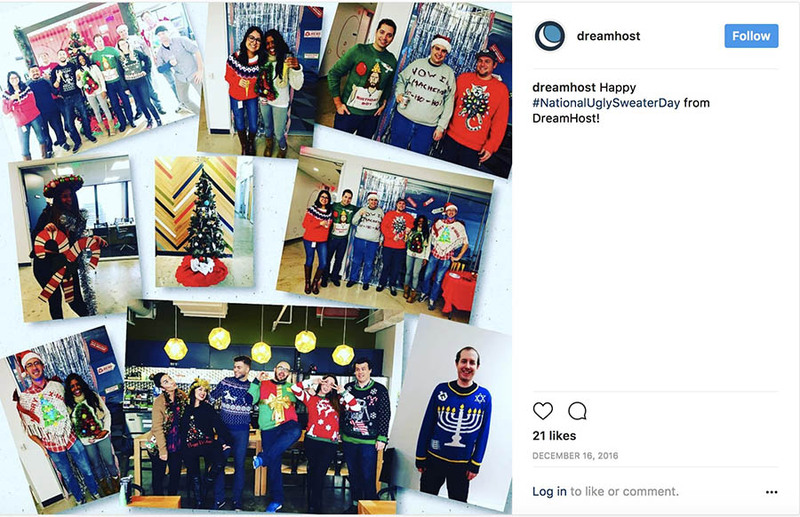 The post Make Your Website Merry and Bright with These 10 Holiday Marketing Ideas appeared first on DreamHost.